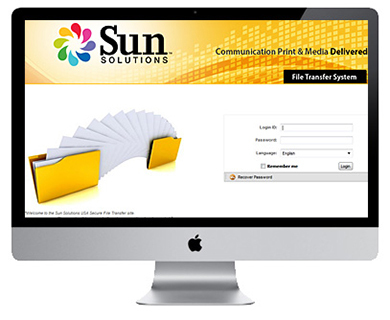 Our file upload system is for Sun Solutions new or existing clients. To access the system, you must have an account setup by a Sun Solutions customer service representative. 1) Request an access account to our SFX (Secure File Transfer) system with your Sun sales rep., customer service rep., or request a new account online. 2) Visit https://sfx.sunsolutionsusa.com and use your assigned user ID and password. 3) Upload files in the folder titled with the project name.